Here are some romantic long distance relationship messages and famous long distance love quotes that can help you to keep on defying the distance and stoke the flames of passion. Long-distance relationships can be deal breakers for many couples, but there are many ways to keep the love alive. Stay in touch by any means possible. There is very little excuse not to do so since technology allows communication in real time between any two places in the world. Keep the communication lines open, be honest with your feelings and live interesting lives apart so that you have tales to tell when the time for togetherness comes. Relationships are strengthened by separation, but make sure that you both understand what you are getting into because long, lonely nights are just a little part of it. Keep the passion alive and the connection strong with a few passages that will stoke sweet sentiments in your faraway love. A thousand miles between you and me. So many months apart, and still I love you with all my heart. When we’re apart, the days seem like months. Everything is moving in slow motion except my heart pining for you. I hope to see you soon. I miss you even in my sleep! Why can’t you just teleport here? Long distance relationships are living proof that love is not just physical. 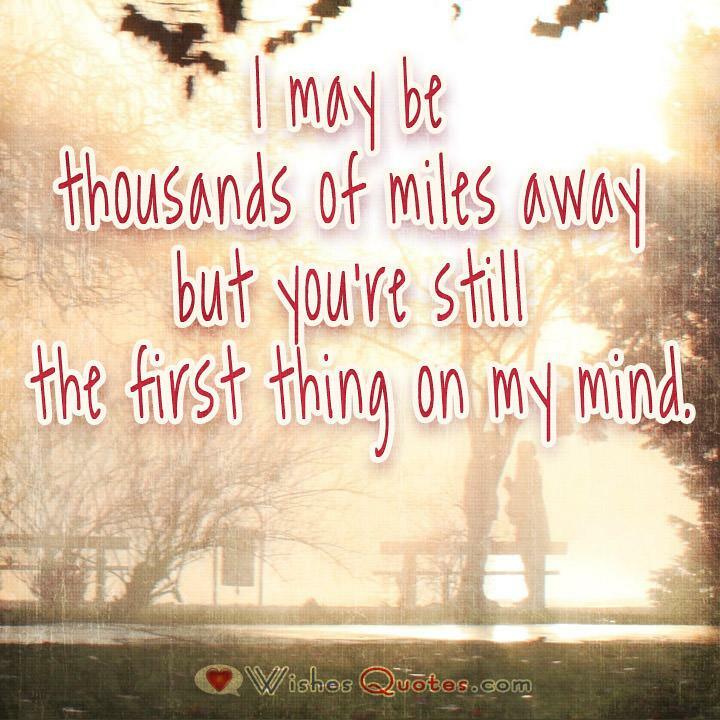 I can feel you next to me even when you’re thousands of miles away. Me and my lonely heart are counting down to the day when we meet again. I say good morning; you say good night. Long-distance living isn’t alright, but I know we have what it takes to stay tight. Hang in there. Time passes swiftly when all I can think of is coming home to your loving arms. As long as you’re in my heart and I am in yours, there is no distance great enough that our love can’t travel. Distance gives us a reason to love harder. The reason it hurts so much to separate is because our souls are connected. I sit in the waiting room of life waiting for the day when I will see you again. Day turns into night; weeks turn into months, and still I wait for that day when we can really be together. That grinding sound you hear is the sound of my heart slowing down as I await your return. My heart doctor called. He said I tested positive for a broken heart. I told him I know of a cure: you! Please be back soon. Missing someone gets easier every day because even though you are one day further from the last time you saw them, you are one day closer to the next time you will. A part of you has grown in me. And so you see, it’s you and me. Together forever, never apart. Sometimes in distance, but never in heart. I hear voices in my head telling me you’re near. You’re there not here, but it doesn’t matter right now because we will have a lifetime to live our vows. You and I are worlds apart in the physical sense, but our love is strong enough to weather every storm that comes our way. In my mind, I’m playing an endless loop of all our happy memories together while you’re not here. In my heart, I’m singing about the love we hold so dear. I don’t want to spend the rest of my life texting, emailing snap chatting and messaging you on Facebook. I want to hold you, touch you and hear you whisper my name in the same space and the same time zone. Distance means so little when someone means so much. We are the perfect couple, we’re just not in the perfect situation. I like the sound of your voice even if it’s from a thousand miles away. It keeps me going. It tells me I’m still alive. I miss you. 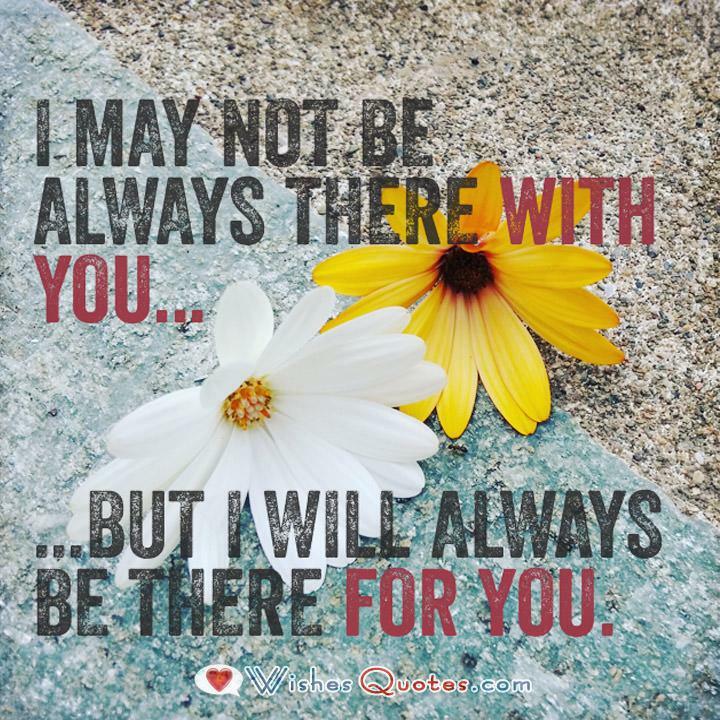 I may not be always there with you… But I will always be there for you. Distance cannot deny us the closeness that we nurtured when distance was just a word we used on Saturday morning bike rides. Together, there is no chasm we cannot bridge. It isn’t fair that there are so many miles between us. It isn’t fair that I have to hug your pillow instead of hugging you. It isn’t fair that I can only touch your face on my cold LED screen. I miss you. Sometimes, long distance relationships feel like living in an alternate universe. It’s 3 am on a Saturday morning, but 3 pm where you are. I am asleep when you are awake. Maybe, I should just stay awake until you get back. Some nights, I want to roll over and talk to you and snuggle until daybreak, but you are miles away, so I roll over anyway and talk and snuggle and hope that my message finds you. If distance makes the heart fonder, then mine is so fondly maxed out. Today I dream of the reality that will happen tomorrow when I see you again. Even with an ocean between us, we are never truly apart. You are always in my heart. Love bridges any distance and breaches any barriers. Soon, we will be together. It comforts my aching heart to know that we are looking at different sides of the same moon. The miles between us mean nothing because I love you here, there and everywhere. I miss you. I miss you and me together. I miss us. There is no ocean wide enough to keep your heart from mine. I dream of the day when there will be no more lonely nights. I miss you! There is no mountain high enough to keep our hearts and souls apart. One more night, one more week, one more month of character-building and strength-inducing loneliness because you are far away. Someday, you will be real. I am jealous of the moon that lulls you to sleep because I cannot. I am jealous of the sun that kisses you awake because I cannot. I hope to see you soon. Absence sharpens love, presence strengthens it. – By Thomas Fuller. Long distance relationships are hard, but they’re also incredible. If you can love, trust, respect, and support each other from a distance then you’ll be unstoppable once you’re physically together. – Anonymous. Absence diminishes small loves and increases great ones, as the wind blows out the candle and blows up the bonfire. – By Francois de la Rouchefoucauld. The Pain of parting is nothing to the joy of meeting again. – By Charles Dickens. How lucky I am to have something that makes saying goodbye so hard. – By A.A. Milne. The scariest thing about distance is that you don’t know whether they’ll miss you or forget you. – By Nicholas Sparks. No matter where I am, no matter where I go, your heart is my northern light, I will always find my way home. – By Michael Kilby. In true love the smallest distance is too great, and the greatest distance can be bridged. – By Hans Nouwens. I close my eyes, thinking that there is nothing like an embrace after an absence, nothing like fitting my face into the curve of his shoulder and filling my lungs with the scent of him. – By Jodi Picoult. It’s not gonna be easy. It’s gonna be really hard. We’re gonna have to work at this every day, but I want to do that because I want you. I want all of you, forever, you and me, every day. – By Nicholas Sparks, The Notebook. In human relationships, distance is not measured in miles but in affection. Two people can be right next to each other, yet miles apart. – Anonymous. Love is missing someone whenever you’re apart, but somehow feeling warm inside because you’re close in heart. – By Kay Knudsen. Absence is to love as wind is to fire; it extinguishes the small and kindles the great. – By Roger de Bussy-Rabutin. Can miles truly separate you from friends? If you want to be with someone you love, aren’t you already there? – By Richard Bach. And ever has it been known that love knows not its own depth until the hour of separation. – By Khalil Gibran. Hope you enjoyed these long distance love quotes. 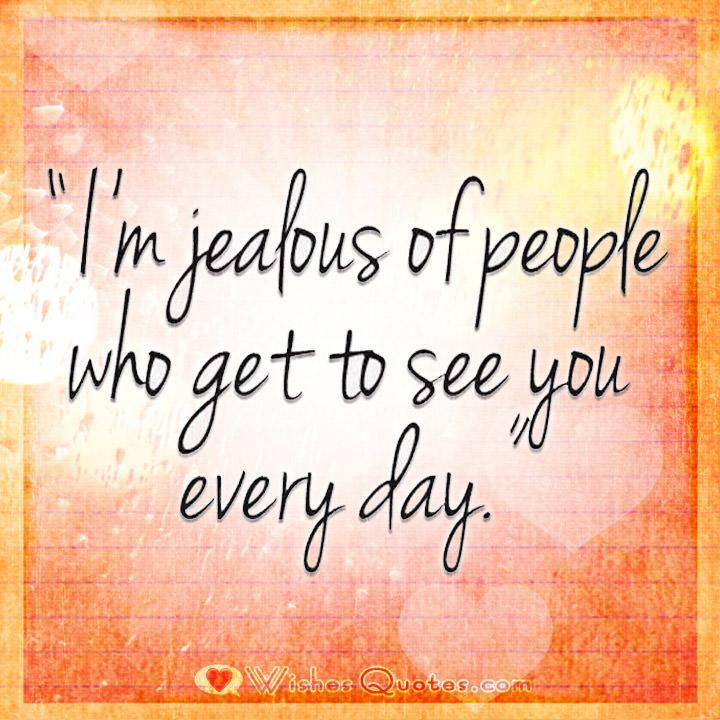 Feel free to share your own favorite long distance relationship quotes in the comments below.